The Battle of Loos was fought between September 25 and October 15, 1915. With most of the major fighting along the rest of the front coming to an end, the trenches of Hohenzollern Redoubt became a priority, as both sides send reinforcements to the area. 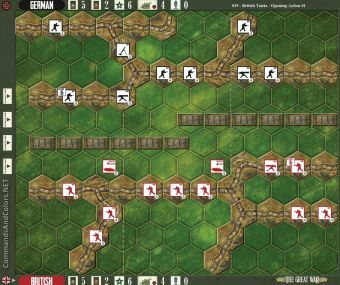 Desperate close fighting continues for control of the Hohenzollern Redoubt, but in the following days, the Germans manage to push the British back to their initial position. The three trench lines in the Hohenzollern Redoubt form a Temporary Majority Medal Objective (start turn) worth 1 Medal for the side that occupies absolute majority of the hexes in the group. 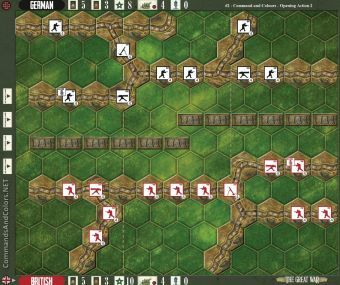 Place a Victory Medal, with the German side faceup, on the trench to indicate it is controlled at the start of the scenario. To determine the starting player, both sides roll 2 targeting dice. The player that rolls the highest total will move first.